Multi-Room Audio (MRA) is a must have addition to the Smart Home of today. Also quite often termed a distributed audio system, it allows you to listen to your favorite music in any part of the home, or even to have different programmes playing in different areas for your different family members. Simply connect normal audio source equipment such as a Bluray|DVD|CD player, iPod, Apple TV, Bluetooth receiver or MP3 player to the MRA system and it will distribute the audio to the desired area of your home. Either installed as a stand-alone system for your audio pleasure only, or wholely integrated into a Clipsal C-Bus Home Automation and control system, allowing you to access, choose and adjust the music program from the same switchplate, touch screen or iPad|Android tablet controllers you may use for lighting and other system control within an automated Smart Home, you will be impressed by the smooth ease of control function and great lifestyle enhancing convenience afforded. 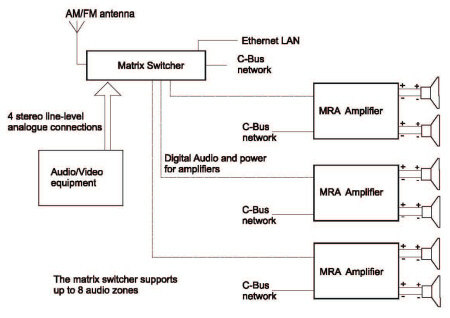 The standard Clipsal MRA matrix switcher control system starts with 8 available music zones. Each music location (music zone) can play from any of the central program sources such as the inbuilt dual tuner digital radios or for example an attached Bluray player, iPod, Apple TV or alternatively can choose local programme source, such as a CD player, Bluetooth receiver or Apple Airplay receiver located within the room. This allows everyone to listen to their favorite music (or even television sound) in separate rooms without affecting the rest of the family. For example, you can listen to music outdoors on the patio while you are having a barbeque and entertaining friends. And should the kids want to listen to their favorite music at the same time, they simply plug their iPod into the local connection in their room or even transmit directly from their Apple iPod Touch or iPhone's iTunes to a Bluetooth or Apple TV receiver. The simplicity of the Clipsal Multi Room Audio system allows anyone to use it - from the novice to the most technically minded person. 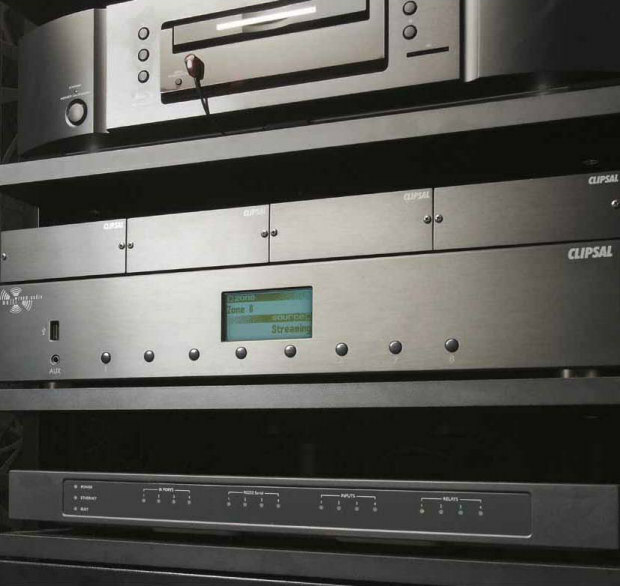 Clipsal has a Multi-Room Audio solution to suit every budget, home and lifestyle. 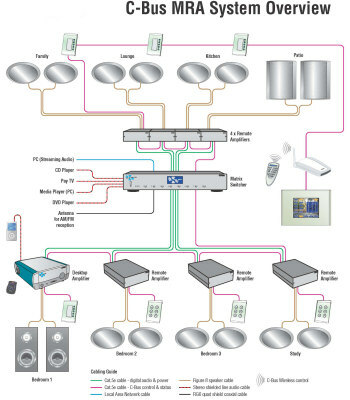 Starting with the affordable Clipsal Audio Solution, which gives you a multi-zone system with multi-source inputs and handy remote controls, through to a fully featured system incorporating C-Bus Multi-Room Audio with touch screen, iPad|Android tablet or DLT wall switch controls of the sound. If you’re including Clipsal C-Bus into your Smart Home to control lighting or other systems, then the C-Bus Multi-Room Audio system is an absolute must. From a single zone on the back patio to a complete multi-room, multi-source system that's completely scaleable. The elegantly integrated solution provides you total control of your music from anywhere in your home and giving control from the same wall switches, touch screens or remotes that control your lights, security system, etc. The C-Bus MultiRoom audio system also allows you to skip CD tracks, change radio stations or change the music tracks streamed from your computer, meaning you don't have to get up and change rooms whenever you want to change your music. 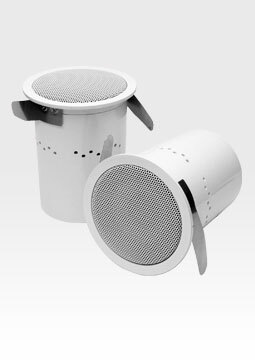 Nous House stocks a wide range of architectural, outdoor, in-wall and in-ceiling speakers perfectly finishing off your Multi-Room Audio system installation. We also stock many suitable input sources such as media players, Bluray players, and Bluetooth local source receivers, or you can add your own such the iPod Touch in a media dock or an Apple TV Airplay receiver. Additional Relevant key words - Multi Zone Audio, multizone audio system, multi room audio, multiroom audio system, Clipsal MRA system, C-Bus multiroom audio, audio multiroom system, distributed audio system, C-Bus controlled audio system, Clipsal CBUS audio system.